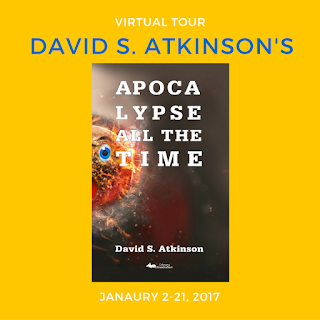 We're thrilled to have an opportunity to jump on the promo-bandwagon for David S Atkinson's novel Apocalypse All The Time. 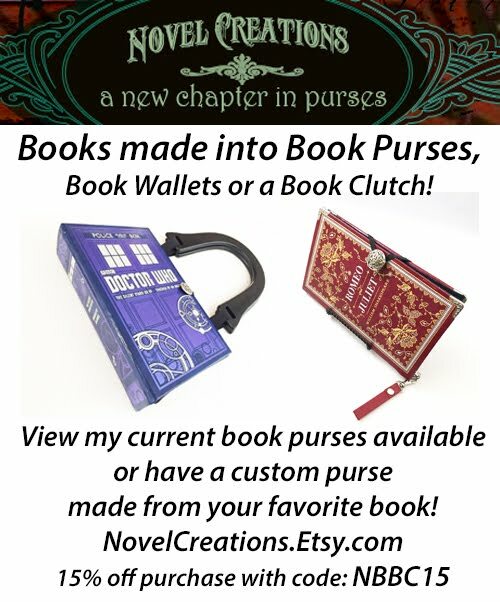 The book was released though Literary Wanderlust in early December. 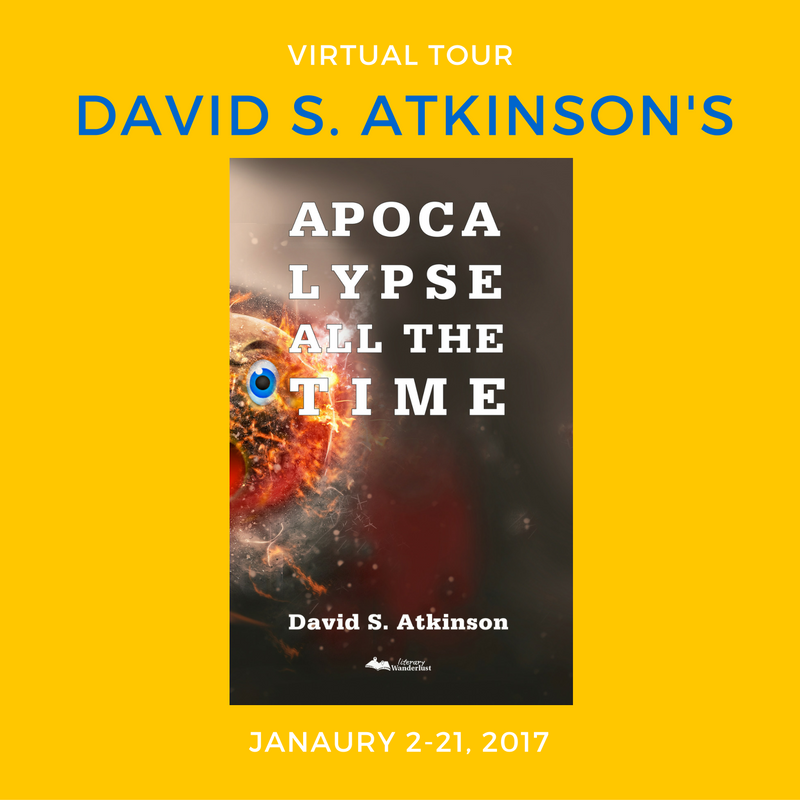 The tour runs throughout most of January, so be sure to stop by the tour's homepage to see what other blogs are saying about the book! I think the creation of a tongue-in-cheek book about the apocalypse such as Apocalypse All the Time can be directly blamed on Night of the Comet. Perhaps you remember, the laugh-filled movie about a couple of valley girls harassed by zombies due to a mysterious comet (unless you were inside a metal structure such as a projection booth or garden shed, such as the girls were). Maybe not completely directly, but it's certainly in there somehow. After all, weren't the late seventies and early eighties training us to laugh at the end of the world? WarGames, Spies Like Us, the list goes on. Reflecting, I think of all of the people around the age of my parents who talked of duck and cover drills, of the Cuban Missile Crisis, of being terrified of the certainty that nuclear war with the Russians was going to end humanity…and soon. The threat was not less by the time people of my age group came along, but I think the world had lived under the threat for so long that most thought it wouldn't happen unless some catastrophic accident occurred. We still lived under the idea that the end of the world was a button push away (growing up as I did within twelve miles or so from Strategic Air Command, meaning I'd be glass instantaneously if a full-blown nuclear war ever occurred) for too long. It almost no longer seemed real. Certainly not the way that it seemed real to any kid who ever hid under a desk from the Russians. It's funny, because there was still the danger. For the next group, the Cold War ended (or so it seemed, recent events perhaps indicating that we should again start at least an eighties level of concern) and so they didn't even worry about it as much. For us though, nuclear war was a regular topic of conversation…just not with the fearful reverence of our parents. It was too absurd, too unreal…even though we were living in it. 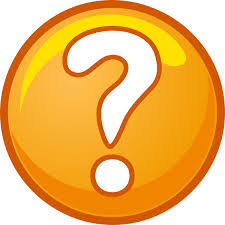 Who could take the end of the world seriously when it was supposedly just around the corner but still never came? What else could a childhood like that lead to other than Apocalypse All the Time? Obviously I don't know…because Apocalypse All the Time is what I came up with. Hope everyone digs. Doesn’t it seem as if someone issues a new apocalypse prediction every week? Y2K? The Mayan apocalypse? The Rapture? Doesn’t it seem endless? 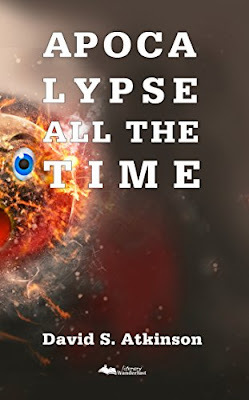 As opposed to the traditional trend of post-apocalyptic literature, Apocalypse All the Time is post-post-apocalypticism. Marshall is sick of the apocalypse happening on a weekly (if not daily) basis. Life is constantly in peril, continually disrupted, but nothing significant ever happens. The emergency is always handled. Always. Marshall wants out; he wants it all to stop . . . one way or another. Even if he has to end the world himself. 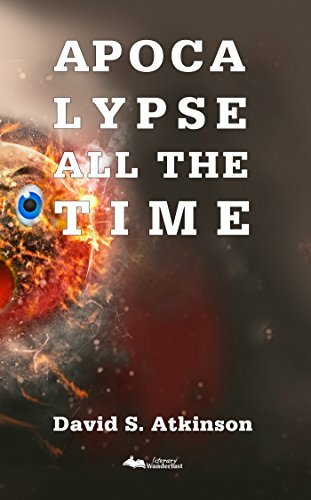 Apocalypse All the Time explores humanity’s fascination with the end times and what impact such a fascination has on the way we live our lives. David S. Atkinson is the author of Apocalypse All the Time (forthcoming from Literary Wanderlust), Not Quite So Stories, Bones Buried in the Dirt (2014 Next Generation Indie Book Awards® finalist, First Novel (under 80,000 words)) and The Garden of Good and Evil Pancakes (2015 National Indie Excellence® Awards finalist in humor). 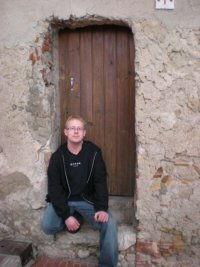 His writing has appeared in Bartleby Snopes, Grey Sparrow Journal, Atticus Review and other literary magazines and journals. Learn more about David and his writing at www.davidsatkinsonwriting.com.